Each July 4th holiday City Art Gallery brings the gallery in Greenville to the Coral Bay Club in Atlantic Beach. Gallerist Torrey Stroud, and her dedicated staff alongside her family transform the beach club into a fantastic two day event for collectors and visitors alike. With a backdrop view of the sand and sea, countless easels and displays go up featuring each of City Art’s regionally and nationally acclaimed artists. The offerings of paintings, ceramics and sculptures, many created specifically for this show, are greeted with anticipation each year by the streams of enthusiastic friends and clients that enjoy their time at the beach, as much as this unique opportunity to view and purchase works of art. Many arriving early to be the first to see their favorite artists, or arranging presales ahead of their visit. Atlantic Beach holds many memories for me. Weekends and summers visiting my in laws first as ECU students, then all the milestones in between, to bringing the kids to the beach, Ft. Macon, Jungle Rapids, the NC Aquarium, Beaufort and more with grandma and grandpa. Oftentimes having an El’s shrimp burger on the way home. During those years we also planned our visits so I could set up my easel at the Coral Bay show painting demos throughout the day, enjoying most meeting the families that became familiar faces each year. I have come to discover that each generation of one particular family have my paintings in their home, that is truly special to me. So in the spirit of family fun and summer memories, my offerings to this years Coral Bay show include my take on some favorite spots. 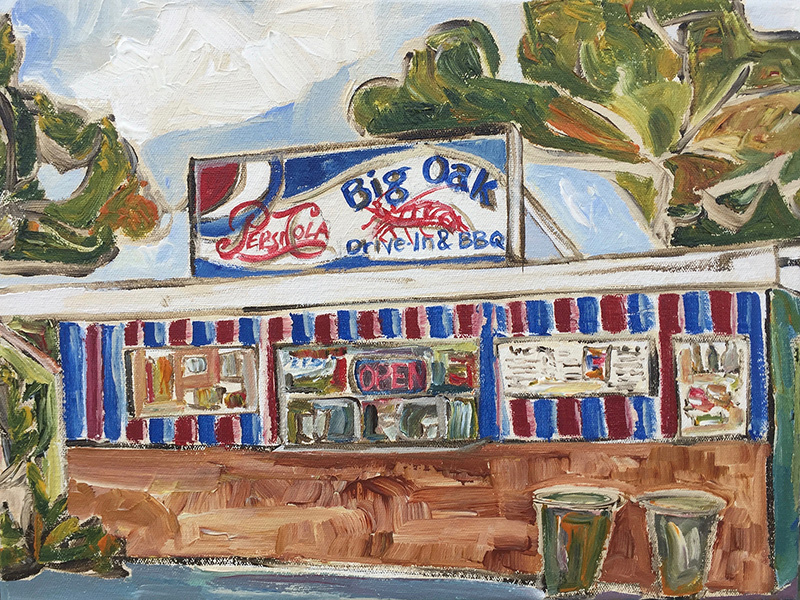 Thank you for having a look at El’s Drive-In, Big Oak Drive-In and Beaufort Grocery Co. Be sure to click above on the image to see all three. Let me know which shrimp burger is your favorite! Happy 4th of July! For more information about City Art Gallery’s Annual Summer Show at the Coral Bay Club visit www.CityArtGreenville.com or call 252-353-7000. New Kristin Gibson still life and summer florals will also be delivered for this show. Snapshots! Snapshots in Paint. 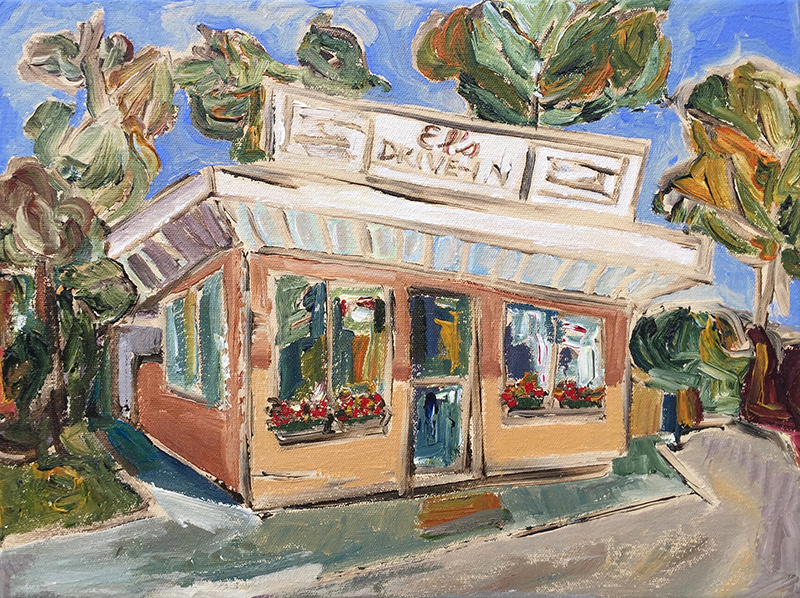 An ongoing new series of small paintings by Kristin Gibson. Original paintings 3"x5" painted on solid wood panels. These little landscapes are ready to hang in a collection or be a colorful bright spot anywhere. The cradled solid wood easily perches on a bookshelf, mantle, table, desk in your home, office, dorm or tiny house. The natural wood complementing keepsakes, pottery, family photos, an arrangement of shells or vase of flowers. These Snapshots are the spirit of a place. The view while walking. The color, texture, moment, memory. Captured in Kristin Gibson's alla prima vibrant palette of lively thick brushwork. Original art priced accessible for art lovers, new collectors and gift givers of all ages and occasions. Thank you for having a look. I hope you may find a Snapshot in Paint that speaks to you and reminds you of a favorite place to be, or you see something to give and share. Preserving our environment and ecosystems is vital, $1 from each 3"x5" painting sale will be donated to National Parks Conservation Association. Enjoy meeting gallery owners/artists Thom and Linda, as well as gallery artists in an always festive and fun atmosphere of the beautiful gallery. Fresh new works will be on view and available for collectors of all ages from Artshak’s sculptors, painters, jewelers, potters, mixed media artists and more. Tulips, 18x14 ©Kristin Gibson pictured here is one in a a new collection sent for Spring to Artshak. Delicious catered appetizers and treats are always artfully presented as well. All are invited to visit! 25% off all Kristin Gibson paintings weekend of open house. I invite you to visit my Etsy Shop, have a look around and become an admirer by clicking on the "Favorite Shop" button. If you do, email me your address at kristin@fineartandfabric.com and I’ll send you a surprise in the mail! This collection of original paintings combines my appreciation of our National Parks and natural places, and the increasing need to protect them. Each sale will benefit our National Parks. These are different from my still life and interior works on canvas that my galleries represent. These 8x10 "snapshots" are painted on birch panels cradled by solid wood, ready for hanging or perching on a mantle or shelf. Thanks for taking a look, I hope you see a favorite place you may have visited! Kristin Gibson, is delighted to contribute her piece titled “Apples for Africa” created for Tyler White O’Brien Gallery’s Fifth Crayons Matter Benefit Event! 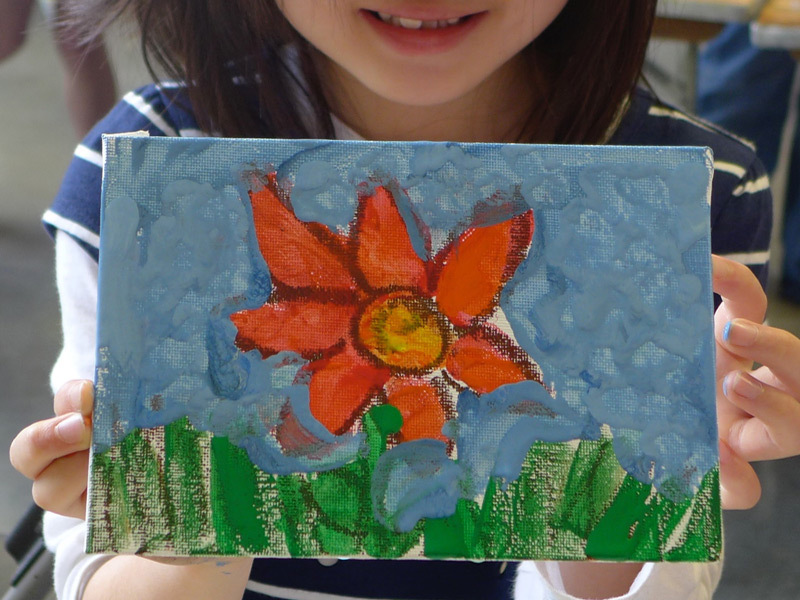 Gallery artists are invited to donate a crayon inspired work of art with all proceeds from the silent auction directly given to Crayons Matter. Please visit crayonsmatter.org and tylerwhitegallery.com to learn more. A pack of crayons is all it takes. Because crayons matter. East Carolina University will present The Thirteenth Annual Youth Arts Festival on Saturday, March 25th, 2017 from 10 a.m. to 4 p.m. This event will be held on the "mall" area in the center of campus. In case of rain, the festival will be held in the Leo W. Jenkins Fine Arts Building on Fifth Street. Kristin Gibson, ECU School of Art & Design Alumni in painting and surface design is looking forward to again this year painting with all the kids and families. Wear messy clothes to have fun in, and enjoy many art mediums in one place! The festival will bring over 150 visual and performing artists to campus who will share their creative talents with the children of our community. Varied talented musical, dance and theatrical groups will also be featured at the festival. Children will have the opportunity to visit with artists demonstrating activities such as wheel thrown ceramics, traditional watercolor painting, weaving, blacksmithing, paper-making, printmaking, sculpture, portraiture and a myriad of other visual art media. Featured visual artists will come from surrounding states, North Carolina, Greenville, and from the School of Art and Design at East Carolina University. Children will also have the opportunity to create their own artwork with the help of professional artists and art students. There will be lots of other fun and exciting interactive activities for children of all ages during the day. March 25th will be a day full of "fun and adventure." All children, families and individuals interested in the arts are welcome. Kristin Gibson is honored to be a part of Ronald McDonald House of Durham & Wake’s annual Hearts of Gold Gala. Kristin will be painting a canvas during the evening, capturing a glimpse and spirit of the gala in her unique style. This painting will be part of the live auction. A special body of work will be on exhibit and available for sale, with 50% of all purchases directly benefiting the families of Ronald McDonald House of Durham & Wake. “Through my work as an artist I am most proud of the chances to give back, and supporting Ronald McDonald House of Durham is part of my heart. As a mother that stayed many nights at the House, my family experienced first hand the comfort, hope and solace that emanates from every warm welcome, baked cookie, soft pillow. The House is each amazing person within it, who greets you where you are, in darkest hours, and becomes a light. My family’s journey led to moving here for ongoing care with our team at Duke. With a piece of my heart left in both our former home and Ronald McDonald House, weekly volunteering for Pancake Day and Housewarming, still finds me receiving more light than I can possibly return. Kristin Gibson Fine Art has recently updated to a Pinterest Business profile, follow this link to find gallery news, museum shows, favorite books, recipes and more. Thanks for having a look! We come together in the winter months to share, to seek comfort and nourishment at the table. Scenes of bright fresh fruits and warm repasts draw a contrast with the gray days of winter. Families and friends come together to share. To seek nourishment both physically and emotionally. The rhetorical function of food is to represent the culture of a country. It can be used as a form of communication. The food we bring in warms our soul and the many culinary delights at this time of year are a feast for all our senses. We eat not just with our mouths but with our eyes. Each of the accomplished artists in this exhibition share their vision of the theme 'At The Table’. Collection includes paintings, ceramics, sculpture and jewelry. Show runs through February 10. Winter Show brings together over 120 artists each year from across North Carolina and constitutes a comprehensive survey of the finest art and craft being produced in the state. The artists come from around the state, with a mix of mediums including painting, sculpture, photography, ceramic, jewelry, woodwork and fiber works, all within a harmonious installation. Artists showing work in the exhibition vary not only by mediums, but also by experience, background and perspective. The public is invited to view a carefully curated selection of works from emerging and returning North Carolina artists in The Gallery at GreenHill. With over 500 works all available for sale, Winter Show is the quintessential showing of art produced by North Carolina artists today. Each year Winter Show brings together over 120 artists from across North Carolina and beyond and constitutes a comprehensive survey of the finest art and craft being produced for sale. At the public opening on December 4, join us a fun afternoon for the whole family. Visitors can enjoy holiday cookies and view Winter Show in a relaxed setting. Led by artist/educator Steven M. Cozart, student docents from Weaver Academy will be giving presentations on artists and works featured in Winter Show. Free and open to the public. Donations appreciated. First Choice is an exclusive art buying opportunity on Wednesday evening, November 30. Patrons buy an art credit at $500, $1,000 or $2,500 increments which is applied toward the purchase of their artwork. Kristin paints and gives back to our National Parks through her Etsy shop, enjoy a look here. ©2019 Kristin Gibson. All original images on this site are the copyrighted property of Kristin Gibson.